This now traditional letter of the beginning of the year is an opportunity to recall the actions carried out by our association during the year 2018 and to give some information on the events planned for 2019. One of the 2018 milestones was the 14th GERLI International Lipidomics Meeting, brilliantly organized by Yonghua Li-Beisson and Frédéric Carrière (members of the Scientific Council), associated with a local team. This event took place from September 30 to October 3 in beautiful surroundings and under the beautiful weather, at the Hotel Royal Convent of Saint-Maximin-la-Sainte-Baume in the department of Var. The global theme “Biogenesis and Fate of Lipid Droplets” has been divided into five thematic sessions of very high scientific quality (Lipid biosynthesis in plants and microorganisms for bioenergy, green chemistry and nutrition, Enzymes in lipid lipidomics, lipid and lipid droplets, lipid droplets in the gut, from digestion of dietary lipids to lipid-based oral delivery systems), which brought together many prestigious guests as well as a hundred researchers, 35% of whom were from other countries. The plenary lectures of this meeting as well as a selection of the oral communications will soon be gathered in a special issue of the journal Biochemistry. We also took advantage of this gathering of the “lipidic community” to celebrate the 40th anniversary of our scientific society, initially created in 1978. This sometimes touching retrospective is freely available on the GERLI website (http: //www.gerli.com). In 2018, the Days of the Lipidomyst network (8th edition) were dissociated from the congress and took place in Lyon on October 25-26, organized by Sophie Ayciriex and Agnès Bussy. 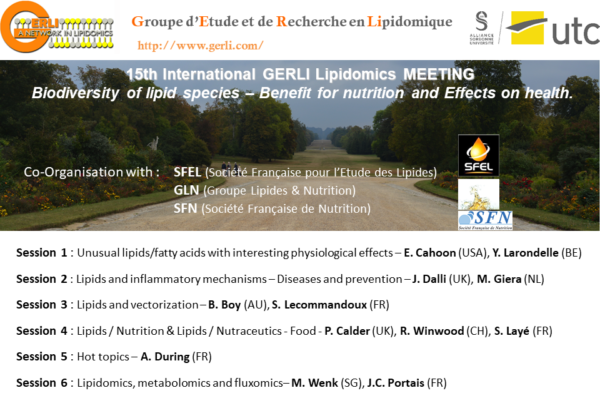 For 2019, the GERLI meeting (15th International Lipidomics Meeting), will take place in Compiègne from September 30 to October 2, with main organizer Brigitte Thomasset, assisted by a local committee. The theme “Biodiversity of lipid species – Benefit for nutrition and health effects” of this meeting leads us logically to interact strongly with the SFEL (French Society for the Study of Lipids), the GLN (Group Lipids & Nutrition) and the SFN (French Society of Nutrition) in the joint choice of sessions and guests. Six sessions are already programmed: Unusual fatty acids and lipid species with interesting physiological effects; Lipids and inflammatory mechanisms-Diseases and prevention; Lipids and vectorization; Lipids & Nutrition / Lipids & Nutraceutics; Hot topics and Lipidomics, metabolomics and fluxomics. This last session will provide a link to the 2 Lipidomyst Analysis Days (9th edition) organized by Sébastien Acket, Lydie Humbert and Franck Merlier on the topic “Flux and Lipidomic Labelling”. Do not hesitate to consult the GERLI website now to find out about the scientific program, the guest speakers and to inform you about the submission and registration dates. As always, I would like to remind you of the pedagogical interest of the GERLI meetings, which represent a great opportunity for PhD students and post-docs to participate in a meeting which is referenced as international by the doctoral schools since our transition to the English in 2003. An important and always dynamic mission of the GERLI is to submit each year a PhD Award for outstanding work in the field of lipids, conducted in a French laboratory. In 2018, two prizes were awarded to Léa Wilhelm (IGBMC, Strasbourg) STARD3 for her thesis on “a new actor in cellular cholesterol trafficking”, and to Matthieu Platre (ENS, Lyon) for his work on “Localization and function of anionic lipids in cell organization and plant development”. These awards illustrate once again the multidisciplinary nature of the lipid themes supported by our society. For 2019, the application campaign for the Thesis Prize will be open at the end of February and until the 15th of April. Feel free to disseminate this information widely and to encourage applications in your laboratories. The missions of GERLI finally go through the regular animation of our scientific network through our Scientific Council and our website (http://www.gerli.com). The year 2018 first allowed the renewal of the members of the Scientific Council with the arrivals of Zoubir Amri (Nice), Abdou Rachid Thiam (Paris) and Philippe Soudant (Brest), followed in 2019 by that of Benoît Colsch (Saclay). The establishment of a new website, functional since the middle of 2018 thanks to the strong involvement of our new “webmaster” Michel Record, is a very important evolution for the future. This new site now allows to make memberships, meeting registrations, submission of abstracts and other documents (thesis prices), and online payments. To conclude, I would like to remind you that, like any association under the 1901 law, GERLI’s activities are financed by the contributions of its members. Any new member is therefore welcome to contribute to the life of the association. As a member, a preferential rate will be proposed for registration at the annual conference and you will contribute to the Ph.D. Prize which may have already rewarded or reward a student from your laboratory. The annual fee is 50 € for the statutory members (attractive price of 90 € for 2 years) and 25 € for non-statutory / retired members. A specific “laboratory” rate is proposed (200 € for 4 people then 25 € for each additional registration) to stimulate the participation of new research teams in GERLI’s activities. Join the GERLI and you will belong to an association contributing to the dissemination, promotion and national and international recognition of your research in the field of lipids.